Purdue’s new president is adjusting to the job. Mitch Daniels says even after months of studying higher education issues and learning about the university, he plans to ease into his new position. 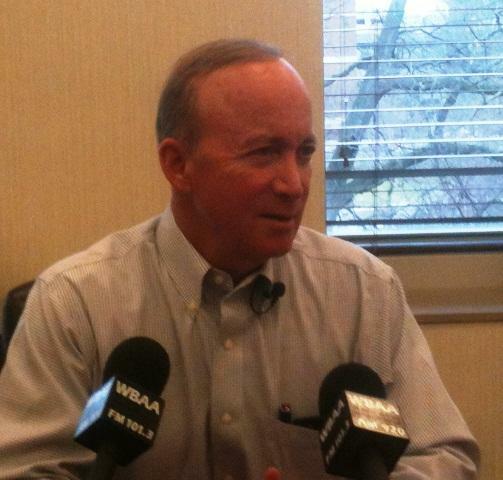 Purdue President Mitch Daniels talks with reporters on his first day on the job. One thing he won’t do is represent Purdue at the Statehouse during the budget process. He did respond to Governor Mike Pence’s proposed 1% funding increase for higher education in the next state budget. Daniels says he’s glad it’s an increase and thinks Purdue will work with whatever the legislature and governor decide. He plans to continue to gather input from the campus community has he transitions into his new job. Daniels says he’ll be communicating with students, faculty and staff in a few days on a course of action for the near term. Daniels says some possible themes are greater accountability, administrative costs, moving technologies to the marketplace, and placing a value on what is taught at the university. He says all of those present opportunities to economize, which should lead to reinvestment in students and faculty.